I know, I’m late again. I was supposed to post this last Monday, but I wasn’t able to gather thoughts until now. So far, my week has been all about work – I’m not complaining though. I should celebrate pa nga because today marks my 3rd year anniversary here at Sven *throwsconfetti*. 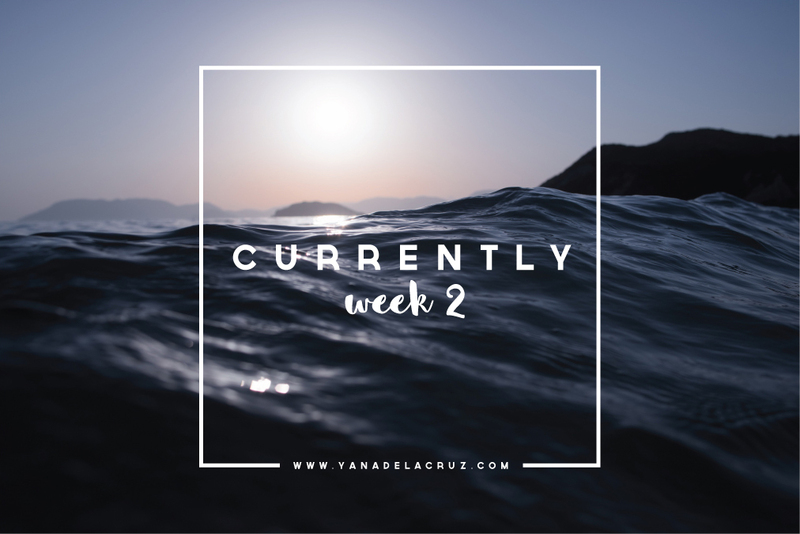 Anyhoo, here’s week 2 of my Currently series. Hope you enjoy! I was reading The Maze Runner by James Dashner last week, but I haven’t opened the book again since then. So far, I don’t have plans for the weekend. I think I’ll be able to catch up on my reading so I could read the next. I’ve been listening to this non-stop ever since it came out. At first, I was like ‘meh’ but after awhile I got hooked! I think my officemates are getting tired of this song because It has been on our playlist since last week. It’s an awesome good vibes song whenever I’m stressed out. I’ve been struggling with this for a few months now. The thing is … there’s so much I want to do, but time has been my problem. Working full time and on top of that working in Advertising really eats up my time. I rarely go home on time and usually when I get home I just sleep. Weekends became my ‘me-time’ where I wake up late and just lounge in bed all day. You know, just recharging from the stressful and crazy work week. Basically, that’s my routine ever since I started working. There are just a few instances where I’m graced by the spirit of the blog gods to write (and sometimes shoot) for my blog or by the inspiration gods to do art (I miss painting!) and other meaningful activities. I’m still scared of the fact that time is just passing by too fast! I should do something about this. Yesterday, I came home at around 10:00 am from a 21-hour work day. Then, I woke up at around 3:00 pm to go to a pre-production meeting for a photoshoot on Friday. That’s around 5 hours of sleep. Good thing though because I’m not in a cranky mood when I got there. A little bit sabaw but I still managed all throughout the meeting. I just want to marry my bed and get some MAJOR sleep. I can’t wait for the weekend so I could disable my alarm and sleep until my hearts content. Yesterday, I got reunited with an “old friend” called Snapchat. Earlier this year, my officemates and I were hooked with Snapchat. We literally chat and send random snaps even though we’re just a few feet away. After a month, our hyped watered down since most of us don’t have time to use the app anymore. A lot has changed since I last used it. If I’m not mistaken, Snapchat updated last September where they’ve added face-recognition filters. My friends were puking rainbows and I was completed jealous! Sadly, that filter is not available anymore but the good news is that there are new ones. Shameless Plug. Add me up on Snapchat: yanadelacruz. I’ll share stories every once in awhile whenever I have free time. I can’t believe that its been 3 years since I last saw my Dad. I still couldn’t believe that I’ll lose him that day and that early! Last night, I had dinner with my officemate when we talked about losing the people we love. I shared about the time I lost my dad, and he told his story about his grandfather. I could distinctly remember the scene inside the emergency room – it was excruciatingly painful. Randomly, I get flashbacks of that day. Often times, natutulala nalang ako and just sit back until I feel better. I really wish that time traveling could be possible so I could do something before his passing happened.